The 12th Istanbul Biennial, organised by the Istanbul Foundation for Culture and Arts and sponsored by Koç Holding, will take place between 17 September and 13 November 2011. Focusing on works that are both formally innovative and politically outspoken, the 12th Istanbul Biennial will explore the complex relationship between art and politics. Serving as primary inspiration for the Biennial, the work of Cuban-American artist Felix Gonzalez-Torres (1957–1996) is a clear example of this kind of artistic practice. 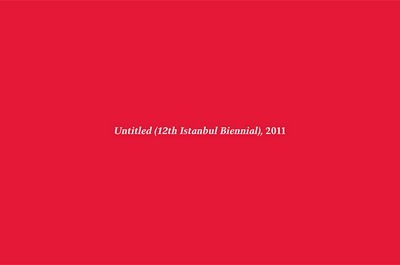 The Biennial title, Untitled (12th Istanbul Biennial), 2011, deliberately references the way in which Gonzalez-Torres named most of his works: “Untitled” followed by a description in parentheses. To remain in line with Gonzalez-Torres' idea of "Untitled" and his desire to circumvent established artistic and political conventions, the names of the artists will deliberately remain undisclosed until the Biennial's opening. A critical position towards preconceived notions of the exhibition is a fundamental part of the Biennial's curatorial premise, particularly in respect to a possible consumption of the exhibition via a list of artists, the names of the curators, or the title of the show. Biennial will be precisely installed in a single, carefully constructed space, privileging the display and juxtaposition of the artworks above all else. The space will be conceived by Tokyo-based architect Ryue Nishizawa of Sejima and Nishizawa and Associates (SANAA) – winners of the prestigious 2010 Pritzker Prize – with graphic design developed in collaboration with Jon Sueda of Stripe, San Francisco.